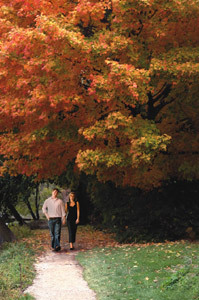 In the 68th issue of the Bed and Breakfast E-Traveller, we take you to Stratford, Ontario. The fall theatre season is alive with the most popular plays of the summer, as well as plays that promise to challenge the intellectual in you. There’s Oscar Wilde’s An Ideal Husband (oh, don’t you wish?). Oklahoma! stomping across the Festival’s thrust stage until November, and A Comedy of Errors and My One and Only are here until the end of October. And a bonus for theatre-lovers of all stripes is the special fall savings of up to 30% off on selected performances. 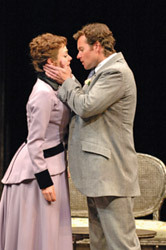 Visit www.stratfordfestival.ca for details. In the autumn in Stratford, our festivals and events take a swerve over to real back-to-basics outdoor fun. That’s all part of taking our place in a thriving agricultural community—fall brings corn to its full height, pumpkins to maturity, apples to full ripeness—and the fact that a hayride with apple cider appeals to the kid in everyone. Ah! Autumn foods fresh from the harvest, when Perth County is a veritable cornucopia of our farmers’ efforts. Stratford knows food. The 100-Mile Diet has a lot of people talking and thinking and we took that further—Stratford’s top restaurants and their chefs have created 100-Mile Menus so you can share in our gustatory wealth! One hundred miles around Stratford provides a mind-boggling range of foods: orchard fruits, Niagara wines, craft brews, vegetables of every kind, grains, cheeses, fish from three of the five Great Lakes, poultry, lamb, beef, emu, game—coffee may be a problem, but who needs coffee when you have ice wine? An Epicurean Trek has been devised for your touring (and eating) pleasure, and we are tickled to be presenting our own 100-Mile Menus. 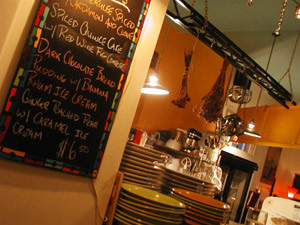 So, Stratford, home of The Stratford Chef School and some of the finest restaurants in Canada, welcomes you to tuck in! When we say colour in Stratford, we mean more than colour from the colour wheel—well, really we do mean that colour too. The splotches of orange in a field of full-size pumpkins, the points of red in the apple orchards, the blaze of trees as the sun morphs their leaves into a salad of blazing red, bright yellow and orange leaves on the ground. Sure, we mean that. But we also mean colour as in local customs, the people of Perth County, the colour in the community and the shops, the flavour of life in our little city. 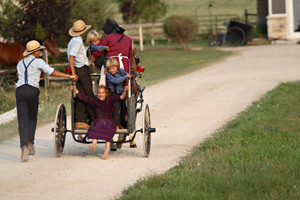 We offer this autumn an almost once-in-a-lifetime opportunity to meet and observe the Amish community and its citizens going about their everyday business. You’ll see their way of life, their culture and their skills, how they make their livelihoods – in a world without electric power. Fall brings a whole new season of reasons to shop (as if you need a reason! Pshaw!). 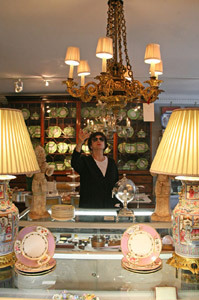 Intelligent shoppers—and pack rats—shop early for holiday gift giving, and the nip in the air says, “buy a new jacket, you fool, and a scarf, and a pashmina, maybe a perfect hutch or china in our great antique shops,” or mingle through the artists’ studios. Artists and artisans plunge into new pieces to restock their studios, and the theatre gift shops have been known to offer great prices as the season winds to a close. And if that weren’t enough, the 2008 edition of The Quilt auction takes place in early November (www.thequilt.com). Visit www.fallforstratford.com to experience autumn in one of Canada’s great heritage gems… world class theatre plus Stratford’s culture, cuisine, character - and many fine B&Bs - await. A map of Southwestern Ontario, where Stratford is located, can be found here. The ETraveller is provided by the association listed. Would you like to have your region featured in the next E-Traveller? Click here for details. Interested in past newsletters? Check out our E-Traveller archive. To unsubscribe from the BBCanada E-Traveller, please visit here.